Mar Sarkis and the neighboring monastic caves. Photographed by the author in 1996. Author’s prefatory comment: The human death toll in Maaloula and elsewhere matters far more than any building ever will. On this day, however, a particular building deserves our attention. Today, October 7th, Orthodox and Roman Catholic Christians throughout the world celebrate the memory of Sts. Sergius and Bacchus. The traditional account is that both men were Syrian soldiers who had served with distinction in the Roman legions and were widely respected despite their Christian faith. When, however, the emperor required that they prove their loyalty by sacrificing to the Roman gods, they refused. They were tortured and executed around the year AD 303. They were laid to rest in the city of Resafa, about 30 south of the modern city of Raqqa in N. Syria. Veneration of the two saints spread rapidly through the region. Their tomb grew into a fortified basilica and the city became Sergiopolis, an important pilgrimage center. Its ruins still stand in the desert. It enjoyed the patronage not only of Justinian I and other Byzantine emperors, but also of Persian Sassanids and Ommyad caliphs. One of the more important churches in Constantinople was dedicated to their memory as was a later church in Rome. 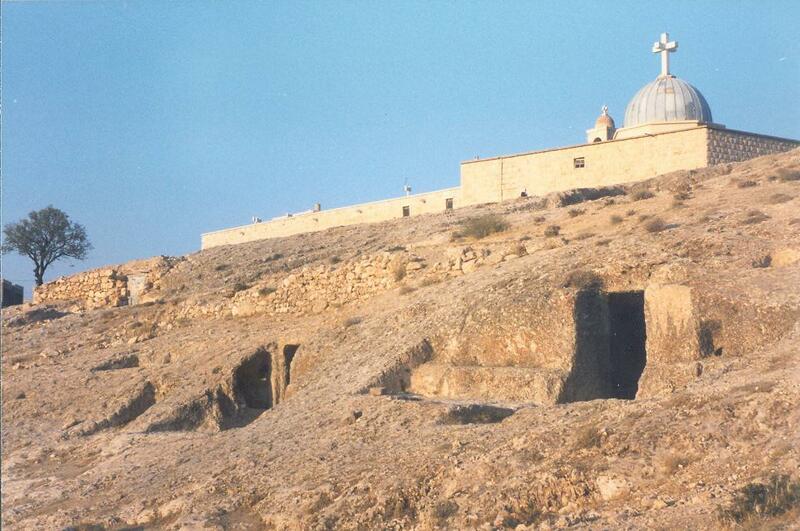 One of the earliest and most important churches dedicated to their memory lies in the village of Maaloula. The locals call it Deir Mar Sarkis (St. Sarkis Monastery). Its very name suggests its age, for it uses the ancient Aramaic word mar instead of qadees, the Arabic word for “saint”. The church itself was built over the remains of a temple to Apollo that had fallen into disuse when the village became Christian, sometime in the mid-late 1st century. It was almost certainly built within a few years of the death of Sts. Sergius and Bacchus, between the legalization of Christianity in AD 313 and the Council of Nicea in AD 325. A bishop Eutychius, from St. Sergius in Maaloula, is listed among the roll of bishops who participated in the council. Its marble altar was semi-circular with a raised lip around the outside. The design came from pagan practice, where it was necessary to drain the blood of sacrificial animals. It was clear, however, that this altar had always been Christian. It had a plain border instead of one with sacrificial processions and reliquary instead of a drainage hole. Such altars were banned at the Council of Nicea, a further indicator of the church’s early date. The masonry also uses timbers as expansion joints to protect the building from earthquakes. The carbon dating on the wood accords with the other evidence. The church also contained a number of antique icons, many of them 400 years or older. On September 4th, the chaos of Syria engulfed Maaloula. 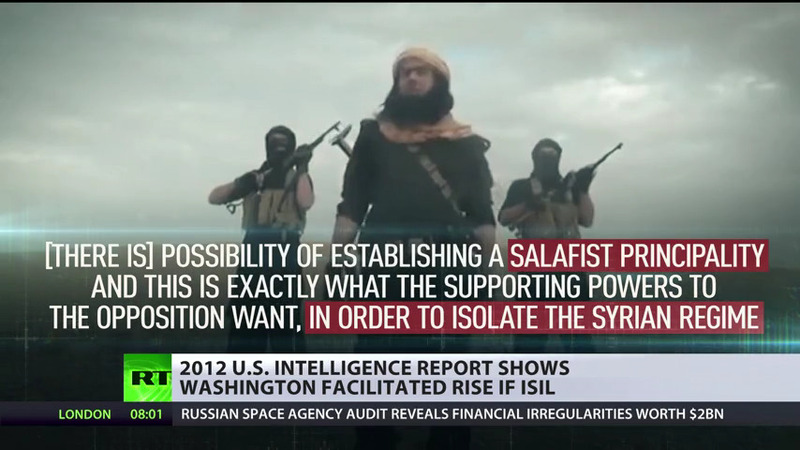 Fighters from the al-Nusra front, which the U.S. State Department clearly identifies as a mere alias for al-Qaeda, seized control of the village with support of the supposedly moderate FSA. Most of the villagers, both Christian and Muslim, fled the village. From Damascus they reported that, in addition to terror and murder, the extremists had shelled and desecrated the ancient church of Mar Sarkis. The supposed evidence told a different story however. I spent many hours of lenten retreat exploring Mar Sarkis and the ancient monastic caves that surround it. When I saw the shelling on YouTube I was indeed horrified, but I also had no doubt about the perpetrator’s identity. The topography of Maaloula is remarkable. Two huge mountain faces thrust out of the earth in a V shape, each at about a 30 degree angle. The village is built straight into the mountainside, right at the base of the V. Towering rock faces surround it on all but one side. And this was the critical issue. Mar Sarkis is nestled behind the mountain face. The opposition forces held this area above and behind the village. They had an easy, short, unobstructed line of fire to the Monastery. They also have a history of violence toward Christians. 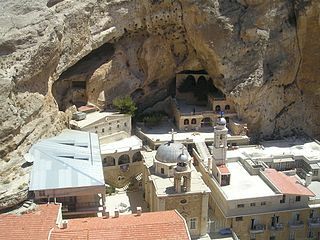 The last time I was in Syria, I saw a newly renovated Mar Sarkis and the Assad regime was clearly pressing to make the most of Maaloula’s tourism value as a potential UNESCO world heritage site. War can change people and lead to extreme decisions, but such bombs would certainly be out of step with my every experience of his regard for Christians, and especially those of Maaloula. In any case, geography was the key issue. BBC and RT reports both showed that government forces had their hands full trying to secure the entry point to the village, some 1.5 winding and sloping miles away and many feet down vertically. The next video showed a tour of Mar Sarkis, but something was out of place. I could not recognize any element of the sanctuary. Then I realized that we were not examining the sanctuary at all. We were in the former gift shop, all of its merchandise now looted or destroyed, supposedly by troops who, to judge from RT and the BBC, had not yet even advanced to the lower village square. 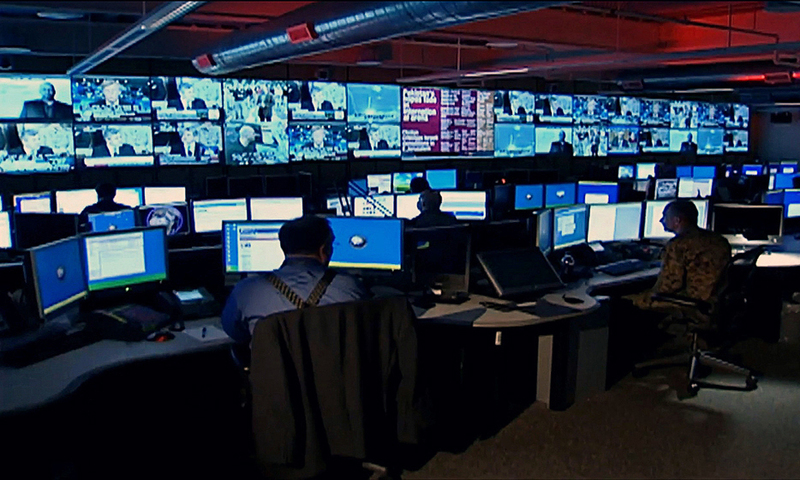 The subsequent articles by Barnard and Sinjab emphasized one more bit of evidence. They rest on video of Mother Pelagia of St. Thekla’s Monastery as evidence that no harm was done to people or nuns. The man to the left is clearly tapping something as she speaks and it gives an audible metallic noise. Another man hides his face just out of camera view behind the nun on the right. As the “Assad shelling” video shows, one could practically walk to the edge of the cliff and drop bombs on St. Thekla’s convent by hand from the position held by al-Nusra. There is every reason to think her assurances were coerced by threat of violence. Subsequent events proved these suspicions correct. Maria Finoshina of RT was of the few English speaking journalists daring enough to report from the actual combat zone. Her videos show the black jihadist flag (not the Syrian opposition flag) flying over the buildings they had occupied. The parties responsible for the chaos also posted celebratory videos (note again the the black flag in the upper right corner). Finally, this past week, a reporter for ITAR-TASS news agency was able to survey the actual damage to Mar Sarkis: http://www.itar-tass.com/en/c32/895365.html. Granted, this is a Russian news agency and therefore pro-Assad in slant. That said, the nature of the damage – targeted destruction of the altar and of Christian religious art – justifies the sensational headline. This is behavior characteristic of Islamic extremists. One might recall the Buddhas of Bamiyan as an instructive example. So, in a nutshell, the initial reports of the refugees proved true, and the sad tale of Mar Sarkis can serve as an instructive tale about the dangers of propaganda and careless reporting about the situation in Syria. I watched Syrian Muslims flock to the holy sites in Maaloula nearly as often as Christians. It was a deeply respected part of their heritage both spiritually and historically. Only one icon is known to have survived, rescued by a Syrian soldier. To judge from his ignorance about it, he is likely Muslim. That is the Syria I once experienced and I pray for its survival.